The red-legged partridge is a small game species widely hunted in southern Spain. Its commercial use has important socioeconomic effects in rural areas where other agrarian uses are of marginal importance. The aims of the present work were to identify areas in Andalusia (southern Spain) where game yields for the red-legged partridge reach high values and to establish the environmental and land use factors that determine them. 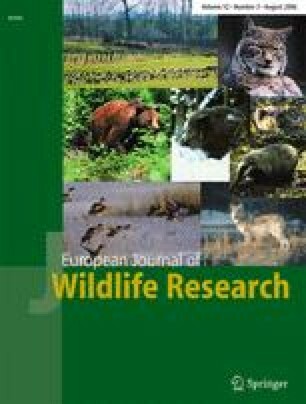 We analysed 32,134 annual hunting reports (HRs) produced by 6,049 game estates during the hunting seasons 1993/1994 to 2001/2002 to estimate the average hunting yields of red-legged partridge in each Andalusian municipality (n=771). We modelled the favourability for obtaining good hunting yields using stepwise logistic regression on a set of climatic, topographical, land use and vegetation variables that were available as digital coverages or tabular data applied to municipalities. Good hunting yields occur mainly in plain areas located in the Guadalquivir valley, at the bottom of Betic Range and in the Betic depressions. Favourable areas are related to highly mechanised, low-elevation areas mainly dedicated to intensive dry crops. The most favourable areas predicted by our model are mainly located in the Guadalquivir valley. A.M.B. is supported by a doctoral grant from Fundação para a Ciência e a Tecnologia, Portugal.